Mango & Tomato: Please vote for me!!! I've entered a recipe contest on TheKitchn.com and would love your votes. The more people vote, the better chances of me winning (I need at least 100 votes I think!). Here is the recipe and the link. Just click on it, and if you like the recipe, give it a thumbs up. Unfortunately, you will have to register, but that should not be too much of a big deal, right? Their website is really great and will never send you SPAM. You can vote for the next 48 hours; the final results will be announced in October. Will be happy to do that Olga! Olga, apparently I have to register tobe able to vote. So I'll comeback to read more about this site later okay. I almost submitted an orzo recipe! But then I got too lazy. Am trying to register so I can vote for you though! Ofcourse I will vote for you! Gonna do that right now! Sure already voted for you! Good luck! I voted for you!! Yeah! 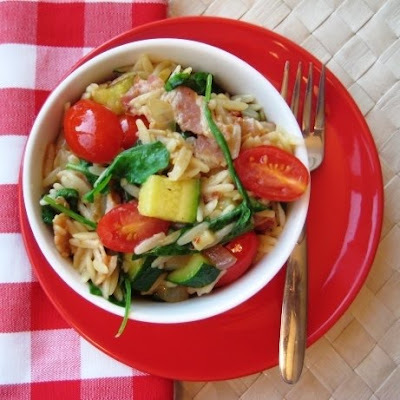 Lovely orzo salad it is too!